The new tablet will consume significantly less power than its current XO laptop, OLPC says. (ArsTechnica) -- The One Laptop Per Child (OLPC) project has partnered with hardware component maker Marvell to create a new tablet device, and a prototype based on a Marvell reference design is expected to arrive next year. OLPC says that the new tablet will consume significantly less power than its current XO laptop. OLPC was launched with the aim of bringing low-cost portable computers and constructivist education to students in developing countries. The project has been plagued with problems and declined in relevance as cheap netbooks and alternatives like Intel's Classmate PC reached the market. OLPC suffered from rising costs, production delays, manufacturing defects, deployment failures, logistical issues, and leadership challenges. The organization made significant staff cuts last year after its "Give 1 Get 1" program collapsed, discontinued development of its software platform, and gave up on its plans to develop a new dual-touchscreen model that was supposed to look like a book. Former OLPC software chief Walter Bender split from the group and founded Sugar Labs to continue independently advancing the OLPC software platform. The efforts of his group have brought OLPC's Sugar learning environment to a broader audience and attracted new contributors. OLPC itself has largely remained quiet over the past year, but founder Nicholas Negroponte has spoken on several occasions about the possibility of moving the organization's mission forward by building a low-cost tablet. Partnering with a Marvell and building on an existing reference design will likely simplify the process of getting a finished product out the door. "Today's learning environments require robust platforms for computation, content creation and experimentation -- and all that at a very low cost," Negroponte said in a statement. "Through our partnership with Marvell, OLPC will continue our focus on designing computers that enable children in the developing world to learn through collaboration, as well as providing connectivity to the world's body of knowledge." 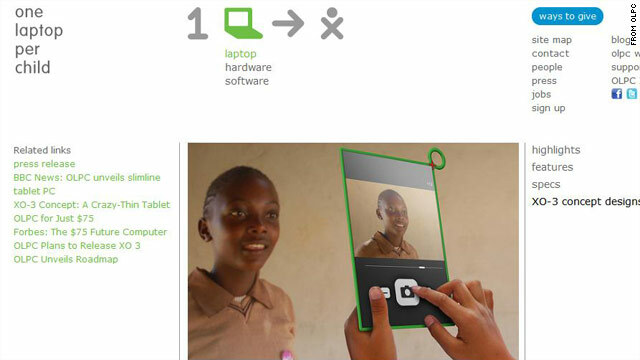 OLPC has also apparently softened its stance on a few other issues. For example, the group is no longer insisting its hardware partners work solely with it if they were pursuing similar projects, an untenable position that was largely responsible for its falling out with Intel. According to Marvell, several commercial hardware vendors will be building their own similar tablets based on the same reference design. Marvell has launched a new initiative called Mobylize to draw attention to the e-learning potential of its "Moby" reference design. The Mobylize Web site touts classroom-based apps, electronic textbooks, and digital lesson plans as the future of education.